A quick update before I disappear! Hahaha! Sorry, managing a blog is really so time consuming! Omg! 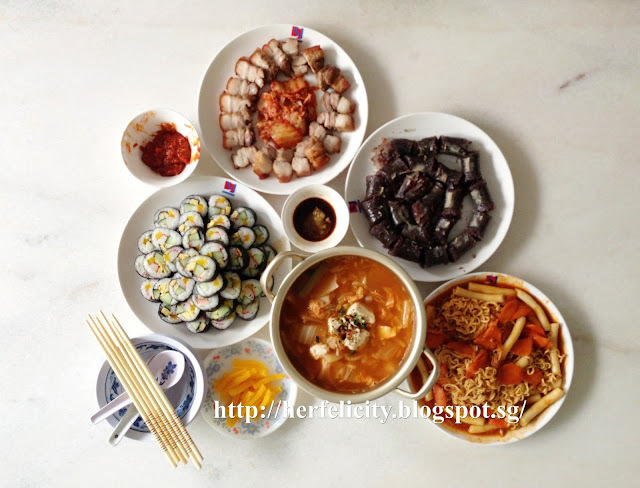 If you could recall, I have previously made a Korean-style dinner for the family as well. Jjimdak is basically simmered chicken with potatoes, carrots and Korean sweet potato noodles as the main ingredients. It is so so so delicious and so so so underrated! 1. Soak noodles in water for 20 min. Then drain water in a strainer. 2. Place chicken, carrots, potatoes, onion and dried red chilli in a pot. Pour seasoning sauce over the ingredients. 3. Boil without lid on high heat for 5 min. Lower the heat to medium and simmer without lid for 20 min. Skim off the foams. Stir every 5-10 min to prevent burning. 4. When the sauce has been reduced to half, add soaked noodles. Boil for 5-10 min on medium heat or until the noodles are fully cooked. I don't know why I think that it is possible to finish all these food. LOL! 1. Bring a large pot to a boil before placing kimchi and sauce ingredients (gochujang, minced garlic and diced onion). Boil for about 10 minutes to soften the kimchi and enrich the broth. 2. Add spam, ham, hot dog and rice cakes. Cook for another 10 min. 4. Serve immediately before noodles soften and set at the center of the table where everyone can help themselves, or plate individually into separate bowls. Then I even went on the make Tteobbokki, Korean spicy rice cake (recipe can be found here). But it was nonetheless a fun and therapeutic session with my kitchen!